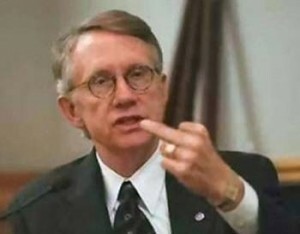 Harry Reid flips off the American people and their Congressional representatives fighting to advance their wishes…. As the U.S. House of Representatives worked over the weekend to develop another continuingresolution that would fund the government while repealing tax increases associated withObamaCare, the Senate was dismissed. Majority Leader Harry Reid allowed senators to leave Washington, D.C., despite the fact a government shutdown is set for midnight unless the two congressional chambers are able to agree on a spending bill. Upon returning to Capital Hill Monday, Reid led the Senate in a vote that ultimately shot down the House proposal, meaning a shutdown is likely to begin Tuesday. The Republican-led House is now in the hot seat, tasked with developing some compromise designed to avoid an interruption in governmental services.House Speaker John Boehner , who has been a vocal critic of Senate Democrats in recent days, once again placed much of the blame on that chamber. Saying the Senate “decided not to work” Sunday, Boehner chastised the body for wasting time. The House is currently working on a plan that could prevent a shutdown, but a unanimous voteSunday sought to address one specific issue should that effort be unsuccessful. Representatives agreed to ensure American soldiers would still receive their salaries in the event a deal is not reached. As of this writing, the Senate has not voted on that proposal. Reid’s reluctance to work with House leadership in a resolution, along with polling that showsAmericans are more likely to blame Republicansfor a government shutdown , indicate some on the left are hoping for an interruption in the federal bureaucracy. While many would undoubtedly regurgitatemainstream media talking points, placing the responsibility for this fiasco at the feet ofRepublicans, accurate information is far more accessible today than it was during the lastshutdown, in 1995. Though the stakes are incredibly high as the 2014 midterm election cycle approaches, this developing story might lead to the realization by some that the left is prepared to go to almost any lengths in preserving a law rejected by most Americans.